This article is about the book on molecular nanotechnology by K. Eric Drexler. For the Joe Satriani album, see Engines of Creation (Joe Satriani album). 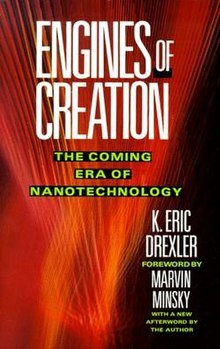 Engines of Creation: The Coming Era of Nanotechnology is a 1986 molecular nanotechnology book written by K. Eric Drexler with a foreword by Marvin Minsky. An updated version was released in 2007. The book has been translated into Japanese, French, Spanish, Italian, Russian, and Chinese. The book features nanotechnology, which Richard Feynman had discussed in his 1959 speech There's Plenty of Room at the Bottom. Drexler imagines a world where the entire Library of Congress can fit on a chip the size of a sugar cube and where universal assemblers, tiny machines that can build objects atom by atom, will be used for everything from medicinal robots that help clear capillaries to environmental scrubbers that clear pollutants from the air. In the book, Drexler proposes the gray goo scenario—one prediction of what might happen if molecular nanotechnology were used to build uncontrollable self-replicating machines. Topics also include hypertext as developed by Project Xanadu and life extension. Drexler takes a Malthusian view of exponential growth within limits to growth. He also promotes space advocacy arguing that, because the universe is essentially infinite, life can escape the limits to growth defined by Earth. Drexler supports a form of the Fermi paradox, arguing that as there is no evidence of alien civilizations, "Thus for now, and perhaps forever, we can make plans for our future without concern for limits imposed by other civilizations." Drexler's 1992 book, Nanosystems: molecular machinery, manufacturing, and computation is a technical treatment of similar material. Nanosystems addresses chemical, thermodynamic, and other constraints on nanotechnology and manufacturing. An updated version of the book, Engines of Creation 2.0, which includes more recent papers and publications, was published as a free ebook on February 8, 2007. The book and the theories it presents have been the subject of some controversy. Scientists such as Nobel Laureate Richard Smalley and renowned chemist George M. Whitesides have been particularly critical. Smalley has engaged in open debate with Drexler, attacking the views presented for what he considered both the dubious nature of the science behind them, and the misleading effect on the public's view of nanotechnology.